Before you can select a gift, you must first understand your company’s policy on gift giving. Staying within those parameters will help make your hunt for the perfect gift much easier. It’s also important to understand simple business etiquette when it comes to holiday gift giving. Avoid purchasing a gift that is too expensive and elaborate and not in line of your recipient’s interests, as your good intentions can be deemed inappropriate. If you feel funny giving your boss a gift for the holidays–don’t worry–we’ve got you covered! Determining a budget is the first place to start when deciding on a gift for your boss for the holidays. While your personal finances and your company’s limit will certainly play a factor into your decision, a good rule of thumb would be too keep gifts between $20 and $50 dollars. Chipping in with a fellow coworker is always a good idea, as gifts that are too expensive will make your boss feel uncomfortable. Cookies: When it comes to the holidays, who doesn’t love a sweet treat? Gifting your boss with delicious Cheryls cookies will be a great way to let them know how much they are you appreciated, all while satisfying their holiday sweet tooth! 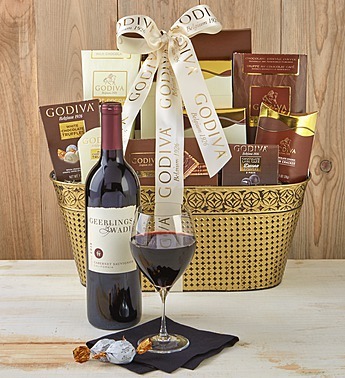 Chocolate & Wine: We can’t think of anything that goes together better than chocolate and wine, and these wine gift baskets take the guess work out of finding the perfect pairing for your boss to enjoy. Breakfast: Do you have a boss that loves breakfast? Who doesn’t! This breakfast box comes with an abundance of fruits and gourmet breakfast delights that will be sure to put a smile on anyone’s face–even those non-morning people! Personalized Business Card Case: This gift checks off all of the boxes on your gift list for your boss. The combination of being personal, but still professional ensures this practical present will be enjoyed by all of the bosses out there! Technology Gifts: For all of your tech-junkie bosses out there, TV streaming sticks make the perfect holiday gift! These tiny sticks hold a lot of power, allowing your boss to connect to their Wi-Fi network, and stream their favorite shows, apps and movies on the big screen! Buying a gift for your co-worker might be a little easier than deciding on one for your boss, as you’ve most likely developed a close bond with the people around you. 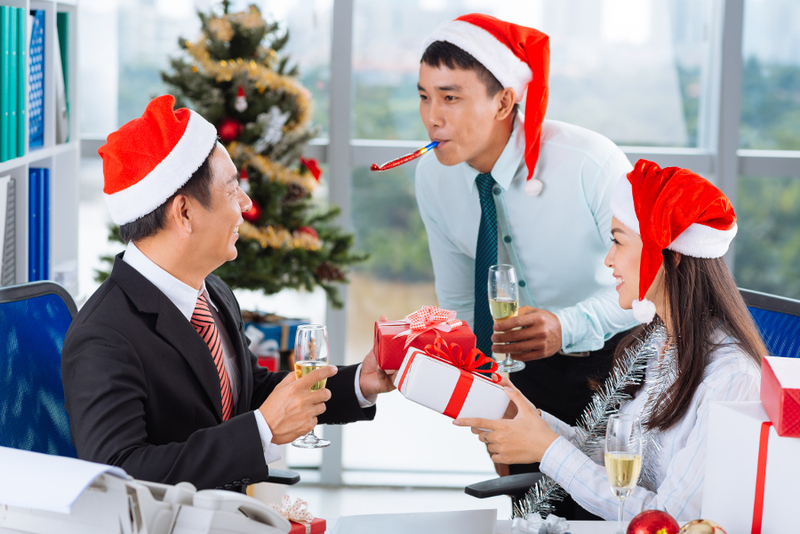 Undoubtedly there will be some co-workers that you’ve grown closer to, but whenever possible try to include everyone on your gift giving list! Depending on the number of co-workers you have to buy for, gifts should be kept between the $10 and $30 price range. Of course, if you have your special work lunch buddy that you spend time with every day, you can spend up to $50–but be sure to give them this gift away from the rest of the staff, so no one feels less important. Candle: A candle is a universal gift that is bound to bring some festive light and holiday fragrance to anyone’s home. Everyone loves receiving a candle, and if you’re feeling extra generous and festive this season, try gifting this holiday votive sampler! Coffee & Tea: Do you spend a lot of time grabbing coffee or tea with your co-worker throughout the day? 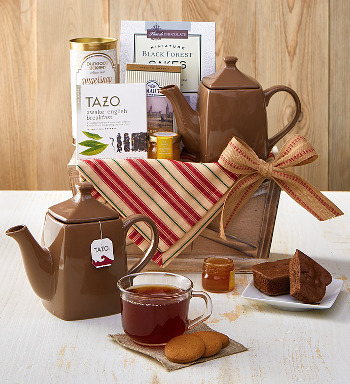 Give your co-worker a comforting gift of tea with this holiday tea collection. Are they more of a coffee lover? No problem! This coffee gift set will be the most delicious way to give them the caffeine boost they need to get through a busy work day! Bath Products: Bath products are practical and useful gifts, but who says they can’t be special and unique too? Finding a specialty shop that makes soaps and lotions with a unique scent is a great way to go. And if you’re looking for a tried and true favorite, your coworker will be thrilled to relax and pamper themselves with a spa gift basket. Plants & Flowers: You can never go wrong with a bouquet of flowers or a plant to brighten up any space–especially the office! Spread some peace this holiday season with Christmas plants that your coworker will be able to enjoy for months to come. If you want to add a pop of color to their space, send a classic Christmas Poinsettia to really put them in the holiday spirit. Fruit: Forego giving individual gifts for all of your co-workers, and get a delicious fruit bouquet for the whole department to enjoy. Christmas tree-shaped pineapple slices and an assortment of juicy fruits with a touch of chocolate will be a real crowd pleaser in the office. Or, instead, opt for a festive chocolate covered strawberry box that will certainly be the sweetest way to spread some holiday cheer! Still unsure about what to get them? You can’t go wrong with an e-gift card! Since the holiday season can be overwhelming with gifts, these e-gift cards allow your boss and co-workers the opportunity to get their favorite floral arrangement, or gourmet gift basket after the holiday craziness settles down. And don’t forget to include a nice message in your card, thanking them for their guidance and support this year and wishing their family a very happy holiday.